Saving Arcadia: A Story of Conservation and Community in the Great Lakes is a suspenseful and intimate land conservation adventure story set in the Great Lakes heartland. The story spans more than forty years, following the fate of a magnificent sand dune on Lake Michigan and the people who care about it. Author and narrator Heather Shumaker shares the remarkable untold stories behind protecting land and creating new nature preserves. Written in a compelling narrative style, the book is intended in part as a case study for landscape-level conservation and documents the challenges of integrating economic livelihoods into conservation and what it really means to "preserve" land over time. This is the story of a small band of determined townspeople and how far they went to save beloved land and endangered species from the grip of a powerful corporation. Saving Arcadia is a narrative with roots as deep as the trees the community is trying to save, something set in motion before the author was even born. And yet, Shumaker gives a human face to the changing nature of land conservation in the twenty-first century. Throughout this chronicle we meet people like Elaine, a nineteen-year-old farm wife; Dori, a lakeside innkeeper; and Glen, the director of the local land trust. Together with hundreds of others they cross cultural barriers and learn to help one another in an effort to win back the six-thousand-acre landscape taken over by Consumers Power that is now facing grave devastation. The result is a triumph of community that includes working farms, local businesses, summer visitors, year-round residents, and a network of land stewards. Heather Shumaker has worked in land conservation for two decades and was coastal program director for protecting Arcadia Dunes. She has a master of science degree in land resources from the University of Wisconsin–Madison and is a national speaker and author of It’s OK Not to Share and It’s OK to Go Up the Slide. She lives in northern Michigan with her family. Heather Shumaker tells the story of the saving of Arcadia Dunes with passion and clarity and with the authority of one who was there from the beginning. I highly recommend this book to everyone who cares not just about the Great Lakes and their freshwater dunes but about the importance of preserving land and water for the well-being of all living things. Having visited these remarkable dunes, I'm all the more taken by the exciting story of their conservation. On a troubled planet, it is stories like this that provide deep and abiding hope. This is a lovely book. This is a book of national significance. It is a story of a monumental accomplishment in conservation, but it's much more than that. Heather Shumaker’s graceful prose and storytelling skill make it entertaining, unforgettable reading. Saving Arcadia makes you care about individual people, a great place, and a rich legacy for our descendants. In a world where so often Goliath wins, Heather Shumaker tells a David and Goliath tale that will startle, frighten, and delight you in both its threat and its humanity. At stake? 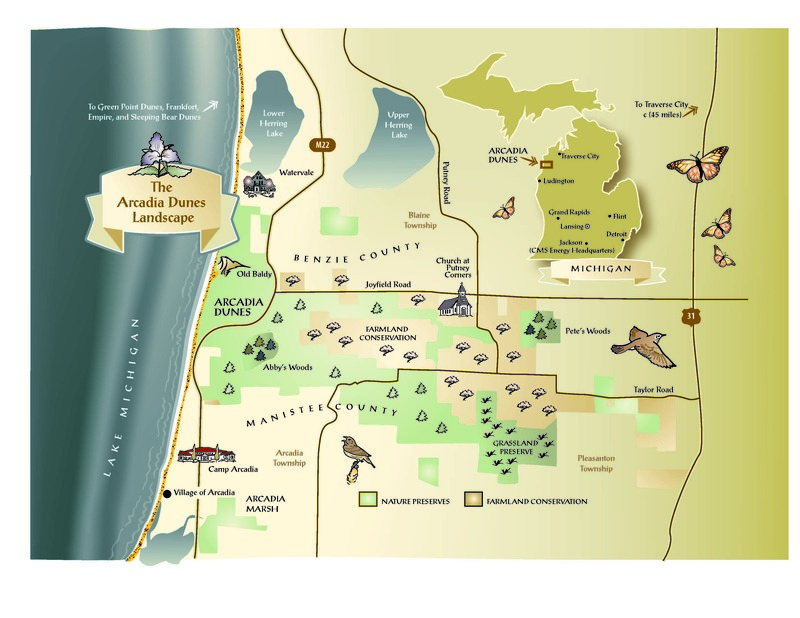 The stunning tract of land known as the Arcadia Dunes, including its miles of Lake Michigan shoreline, forests, open land, orchards, and rare flora and fauna. Heather Shumaker takes us on a dune ride of astonishing tension to resolution that is both hopeful and real. The writing is clean and the story utterly absorbing. What better, in the ‘no place of cyberspace,’ to discover than Heather Shumaker’s nonfiction account of land reclamation and preservation. Saving Arcadia did for me what reading John Muir, Wendell Berry, and Annie Dillard always does: It buoyed my spirits, and made me want to plant a copy of this wonderful book in the hands of every reader I know. Many readers will identify with the deep feelings stirred up by changes threatening geographic areas of personal significance, and be inspired by Shumaker’s chronicle. Formidably and accessibly tackling a very complex story, this will appeal to people who love wild places, and want to see them preserved. Saving Arcadia is the untold chronicle of thousands of people committing thousands of selfless acts, backlit by the sweep of dune, the rush of blue water. Saving Arcadia is an essential portrait of the most rewarding work there is: saving the land we love and telling its story even as the land changes us. This history of one of our most beautiful and quintessential places will sit alongside Roger Tory Peterson and Sand County Almanac and should be read by their enthusiasts as well as businesspeople and others working to create social and environmental change. By saving Arcadia, a way of life is preserved, too. A heartwarming story of hope and preservation that will inspire all communities to follow their heart in preserving those places that mean so much! Heather Shumaker brings a fresh new voice to the importance of conservation. For those who were part of the journey, you’ll cherish this memoir of our experience; and for those who are new to this amazing conservation accomplishment, I encourage you to sit down with this great read, for you’ll be inspired to never give up and to pursue what is most important to you. Saving Arcadia is a wonderful book about an epic effort to preserve a large area of pristine dunes on Lake Michigan and highly productive adjoining farm land. The way in which a couple tiny communities came together over a period of years, raising funds at suppers and bake sales and joining with visionary philanthropists in a dramatic race against commercial development is told in this riveting account. As the drama unfolded, at times the race seemed lost, only to be rescued in a ‘Perils of Pauline’ fashion by long hours of work, passionate presentation, by seeming miracle or sheer luck. Heather Shumaker’s love affair with Arcadia and the people of the region suffuses each page and produces a compelling story, often heart-stopping and always heartwarming. Saving Arcadia is a beautifully told tale, full of hope for our future. Stories like this give hope to every human working to create a healthy and livable future. It’s a classic Hollywood plotline: A powerful corporation wants to develop a large tract of pristine land. Local citizens band together, persuade politicians, raise money, and save the land. Everyone goes home from the theater with a smile on their face. Except, in the case of the Arcadia Dunes, Hollywood had nothing to do with it. The story is real, and it happened here in Michigan. [. . .] here’s a story about action at the local level that made a difference. You might not think a book about the struggle to wrest six thousand acres of Lake Michigan dunes from development and preserve it as a public place would be suspenseful adventure story, but Traverse City author heather Shumaker promises just that - a riveting story that spans decades about a small community of people who preserve a beloved tract against all odds. This work of creative nonfiction may be among the year’s best pieces of environmental drama so far. Following the journey of a local nonprofit as it fights to save a unique dune ecosystem, it features both true-to-life recounting of real events and dramatic creative license that rivals anything in fiction. Saving Arcadia details the many challenges inherent in [the effort to protect Arcadia Dunes] and the wonderful story of how these challenges were overcome by the hard work and dedication of many. 2018 Next Generation Indie Book Award - Result: Winner in the category of "Environment"